What dear little cameo princesses, each with her favourite fruit!! 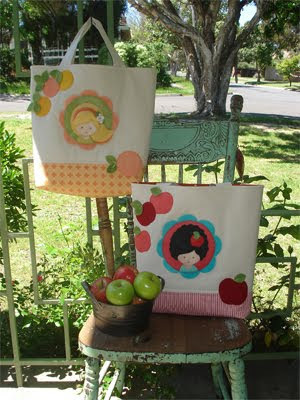 My new project is called 'Toffee Apple & Marmalade" a very gorgeous tote bag to carry any little girls load. The bag is made from a beautiful linen and cotton fabric, with a gorgeous marmalade or rosy apple red contrasting gusset. The centre of each bag has a very sweet cameo, with the most adorable little girl peeking through. 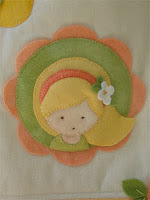 As usual I have used lovely felt and complimented it with yummy fabrics. Absolutely adorable. I think small girls and big girls alike cannot resist these. Beautifully finished. oh simone! 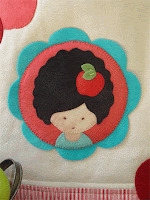 I've just found your blog through lenna's Stitching Cow and I'm in love! I was instantly drawn to your patterns and am going to have to get this cute pattern for my little girl! gorgeous, you are just too clever!